April Fools Day followed a blizzard bringing 8 inches of snow. I love April. So many changes and surprises from critters to new colors along the roadside and in the woods. Just today I saw a Baltimore Oriole at my feeder and last week a beaver waddled across the road to the river. The red maples line the roadside with their red blossoms and the sugar maples glow vibrant green. Marsh Marigolds bloom in April. Every spring the Nature Museum, garden clubs, and libraries offer inspiring workshops taught by lively experts on plants, birds, and gardens. 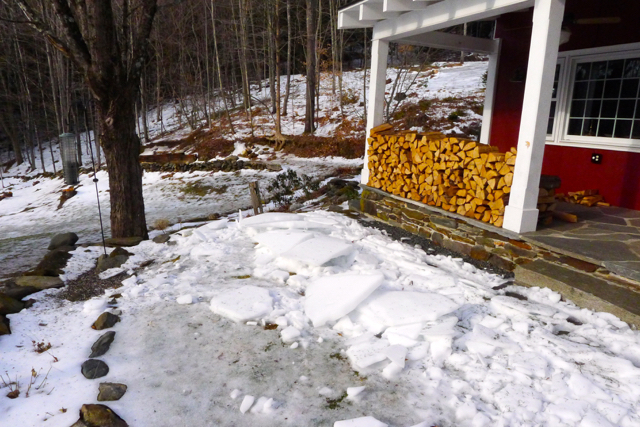 In Vermont, by late March and April, we are ready to head into the woods and the gardens despite the mud and cool temperatures. Always the hungry student, I soak it all in like the thirsty ground soaking up the spring rain. Serviceberry blooms in the woodland garden. Our big project this April was to create our mushroom farm. I had attended a web- based course called Backyard Woods this past winter, and the goal was to come up with three woodland projects. Ian and I chose to create a mushroom farm as our first project. 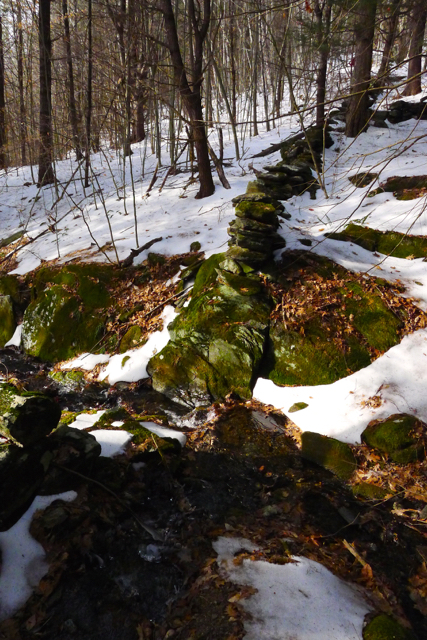 The other two were to develop the trail to the waterfall, including a new bridge, and cultivate more pollinator-friendly shrubs and plants around the yard and forest edge. In mid-April, Ian cut off two sugar maple branches from one of our trees. This had to be done before the tree leafed out to conserve the moisture in the limbs. He cut them into 4′ lengths that fit nicely into the John Deere bucket. We then sent away to North Spore for our mushroom plugs and the drill bit sized to the plugs. We ordered 100 plugs each of Golden Oyster and Shiitake Mushroom spores. Ian drilling the holes about 4″ apart around the maple logs. It only took about two hours to drill, plug and paint the logs with wax to seal in the spores. Now, the hard part– waiting a year for the mushrooms to sprout from the logs. I will be sure to document the harvest next May. Pounding in the spore laden plug. Meanwhile, I plan to forage for Morel Mushrooms this next month. It has been warm so far, so mid-May will probably be harvest time. I look around for elm, ash and old apple trees. I have one spot I return to each year and have had good fortune for the past three years. I have an experienced mushroom coach who taught me how to look, and she accompanies me each year for the hunt. 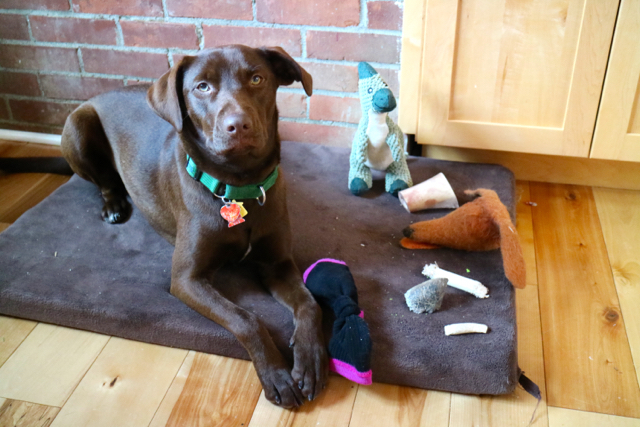 If only I could teach Coco to become a morel hound! The gardens are in good shape this year. The daffodils are all up and have decorated the lawn since Easter. Their yellow is cheery and matches the goldfinches at the feeder. I say that God painted them out of the same paint pot. The forsythia are equally bright. Next color on the horizon is pink. The azaleas, rhododendrons and creeping phlox are ready to burst forth in May. Easter weekend brought out the daffodils. Of course! Resurrection! The goldfinches, rose-breasted grosbeaks, chickadees and woodpeckers been enjoying the feeders, and I continue to break the law by leaving them out beyond April 1st. The bear has not yet appeared, but I am tempting fate a bit so I will begin to bring them in at night to avoid finding bent poles and missing feeders in the morning. Every morning brings something new to see and hear outside. Taking the dog out for her dawn walk allows me that time to connect with nature. Living on a country road, I am comfortable outside in my long bathrobe and slippers. Sometimes I duck behind the garage when a neighbor drives by, but if caught out, I just wave and smile. I inspect the flower beds, gaze into the woods and then check on the chickens. Are all eight in the pen? Is their food and water in good supply? 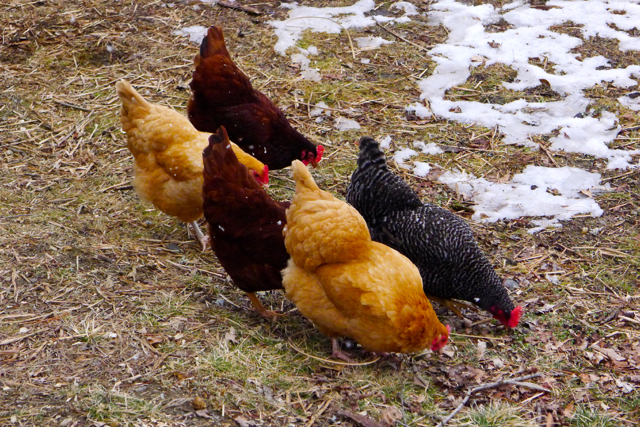 They cluck and mutter until I scatter two handfuls of dried mealworms and exhort them to lay their eggs. Lately they have been laying only two to three a day. I hope it improves. Good old Buff, one of our Buff Orpingtons, enjoys her yard. I have said good bye to April now and welcomed May, a beautiful month. More surprises are in store. It is hard to remember just what we planted last year and what might come up in the next month. Hostas, ferns and wildflowers are just emerging. It is now time to plant the vegetable beds with seeds and starts. Garden chores never end, but they are so satisfying because there is such a sense of accomplishment. Weeding is contemplative, I find, and a good time to pray. And then there are the garden shops and nurseries to visit for inspiration. Mary Oliver celebrates nature with joy. And another lovely poem by Jack Ridl. “Here in the Time Between” by Jack Ridl, from Practicing to Walk Like a Heron. © Wayne State University Press, 2013. Thank you poets for bringing us your precious words, so carefully crafted. And thank you God for creating such a beautiful world for us to enjoy. We are blessed. Snow storm Stella has left town leaving behind her signature décor. The sun has just risen as I stand looking out the window of my upper room, a place of early morning solace. With the woodstove alight and my armchair to my side, I gaze out from a place of safety and warmth. I sigh with relief that the dark storm of yesterday has passed in the night. 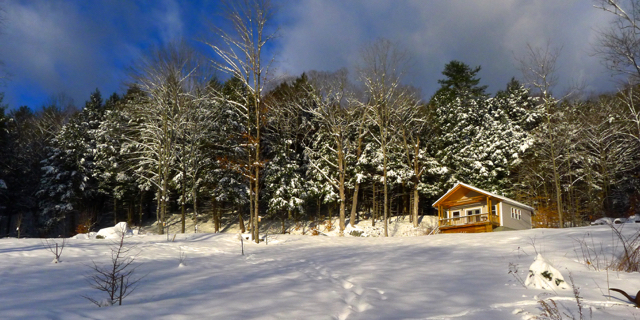 The tall pines and maples up the hill form a textured wall, dark branches loaded down with a thick layer of snow. The field is covered with a smooth white carpet glittering with snow crystals and crisscrossed with occasional blue-grey stripes, shadows cast from the trunks of barren trees. Rock outcroppings shrouded in white stand about like oversized pieces of furniture covered for the off-season. The frog pond is crusted over, unable to reflect the blue of the sky. From behind me, the sun rises from her slumber and highlights the hillside. A vibrant blue sky stretches overhead uninhibited by clouds. No footsteps mar the surface, and no wind disturbs the blanketing of snow. I think how this pristine morning contrasts with yesterday’s black and white blizzard. It had been a blustery day filled with feathers of tumbling snow. When I ventured outside, I walked into a black and white photograph with the house and barns tinted red with a soft color wash. It was a lonely day with schools closed and everyone staying home, safe and warm, thankful that the power stayed on and the roads were sanded and plowed. I am always amazed what a difference a night can make. As if a cleaning crew had swept in, the hours of darkness hid the clearing of the air and the plowing of the roads. I was relieved to feel the change, the darkness lifted. Thank you Stella for blowing in to perform your winter magic. Once the sun is high, I will head out, inhale the crisp morning air, and make tracks to stamp my own mark upon the freshly fallen snow, Stella’s late winter gift. Epilogue: March 31st brought in another snow storm, Son of Stella! It snowed all day, overnight and into April 1st. Nature’s prank for April Fools Day: 10 inches of fresh snow. 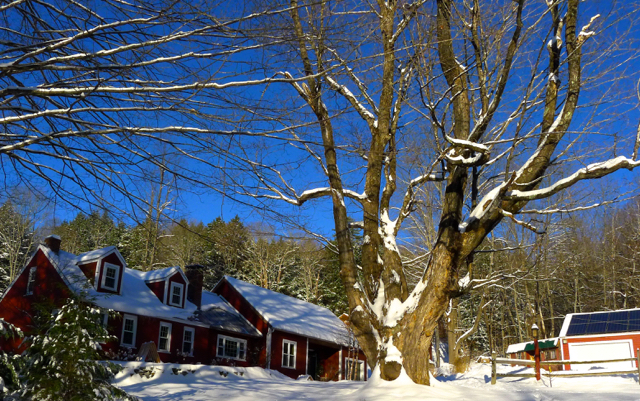 Life in New England is never the same from one year to the next. Whereas last year saw daffodils by the first week in April, spring will arrive later this year. We have no choice but to wait and fill the time with garden planning and bouquets of daffodils from foreign lands. Today’s threshold is a wooden strip beneath my feet. On either side of me are the doorjambs. Behind me is the hallway and in front of me is a snowy path. Without looking back, I walk out into the world through the portal of the present. The air is fresh, cool, and the chickadees are singing out their name. Smoke scents the air. My skin is comfortable, clothed in wool and down. Thank you sheep. Thank you geese. Wrapped in socks and sheepskin, my feet move forward. I reach for the walking stick with my gloved hands, grasping the wooden shaft and planting it into the snow. Stabilizers grip the soles of my boots, ready to claw the ice that threatens my gait. I head out towards the woods. Coco accompanies me dressed in her orange coat so that I can see her when she wanders off into the dark woods. Robert Frost’s line speaks into my mind, “Whose woods these are, I think I know. His house is in the village though.” How fortunate I am to have these woods as my own. I walk the path toward the stream that cascades down to the Williams River. It tumbles over piles of rocks along the way and tunnels under the dirt road through the round culvert. The flow can be swift and thick with flooding or lazy and thin with drought. 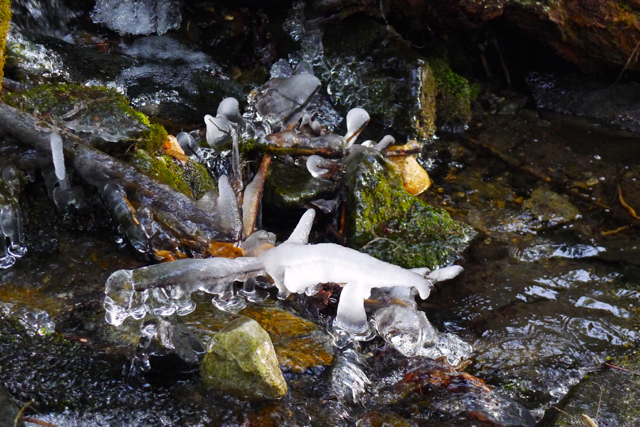 Today the waterfall is curtained with lacy ice, and water secretly runs under the cover of snow, whispering its presence as I stand nearby watching and listening. 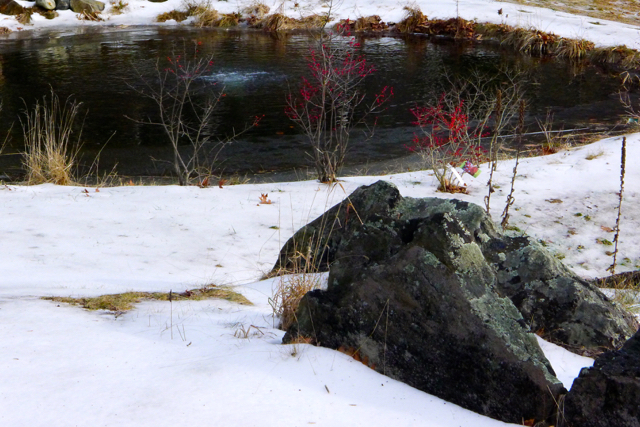 Hoof prints from deer decorate the blanket of snow, heading across the stream and up into the woods. Branches form a sheltering canopy. A whistle signals the train’s journey along the river below, over the crossing and onto the trestle above the gorge. I push away with my walking stick and turn around to head up the hill, a path worn daily throughout the seasons. The hemlocks loom alongside and overhead, their needled branches darkening the woods. The wind swoops in shaking the branches overhead, and snow flutters down like white confetti. The path leads out into the open field with its giant rocks guarding the orchard and nearby pond. Iced over, the pond does not offer water to the deer and other wildlife. Its surface is flat and begs to be walked upon. The apple and pear trees lift their bare branches above the snow, waiting to bud in the coming months. I examine them looking for evidence of deer foraging. So far, they are safe, unnibbled. I head down the hill toward the red house, stopping by the chicken coop on the way to say hello to the chickens and check their food and water. They greet me with squawks and clucks, letting me know that they want some treats. I scoop out a handful of dried mealworms and sprinkle them into a dish. They cluster around happily crunching. The nesting boxes are still empty. 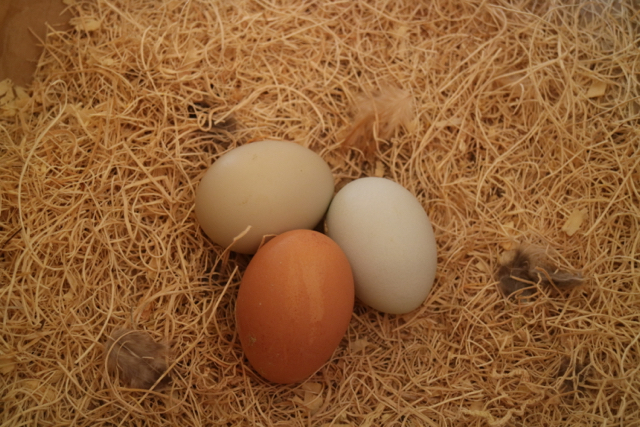 I will have to return later in the morning for my gift of blue and brown eggs. The house is nearby and I head back into the warmth, back across the threshold. My morning walk is now past, but I look forward to the future. 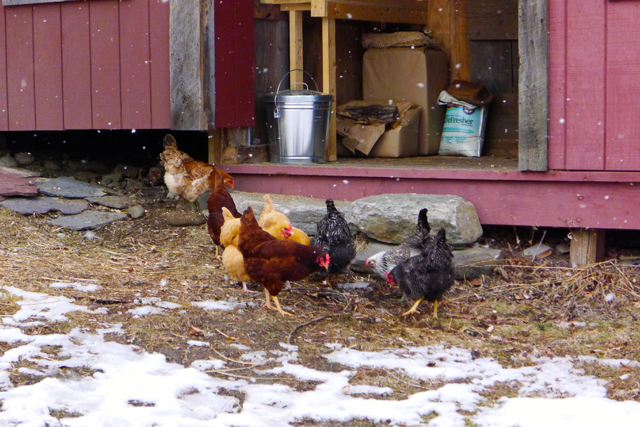 Looking at the chicken coop this snowy February day, I commiserate with the chickens. Being cooped up is hard on all of us, animals and humans alike. I look outside and consider all the clothes and footwear I have to don in order to brave the cold and walk through the deep snow: boots, gaiters, coat, scarf, hat and gloves. Do I take the dog with me? With leash or without? Orange coat or not? Dog treats in my pocket. Sometimes I take the camera to catch those scenes lit up just right by morning or afternoon slanted sunlight. Once outside, I take a deep breath and say to myself, “Yes, it’s worth it.” The biting air spurs me along, and Coco pulls me ahead eager to sniff invisible scents. Having a dog literally drags me outside several times a day. When I let her loose, her romps and racing express such joy that I have to laugh. I trudge through the 12″ of snow, and she bounds through it as if it were just air. We head up the road toward the studio. Once on the driveway, I remove the leash and she tears off into the woods or down to the meadow. Freedom! Her orange coat wraps her body not so much for warmth as visibility. When she disappears into the dark forest, I call for her and then see her under the pines tracking some critter. Soon she comes racing back to my upraised arms and cries of “Amazing dog, amazing dog!” I reward her return with a dog treat. The dog trainer said: “You have to be valuable so the dog will want to obey.” That translates to tasty dog treats, now a part of the grocery bill. Coco has yet to come back at the first call, but she eventually returns, knowing that she will be cheered and treated. We all love that kind of praise. Coming back into the house with eggs in hand is a lovely reward for our cold foray. 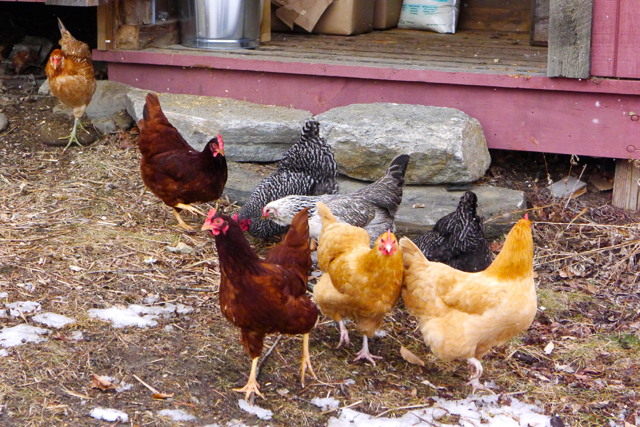 The chickens always greet us with their clucking and chicken talk as we check on them each morning. I add food to the container, refill the water and give them a handful of dried mealworms along with yesterday’s vegetable peelings. Coco pushes her way into the coop to eat the droppings and grab a mouthful of chicken food. I shoo her out when she causes too much chicken fluttering, but they tolerate her well. If I let the chickens out on a sunny day, I have to keep Coco inside the house because she herds them back into the coop, and she is not always gentle. They say that chickens are the gateway farm animals, but I have closed the gate to anything else. No goats, sheep, cows or a horse at this point. Too much work! By the time the cats and the dog are fed, watered, scooped and pooped, I have spent a fair bit of time on animal chores. I am working on my timing so that I have my tea and quiet time before they are needing attention. The chickens can wait until the sun is up and I am dressed for the outdoors. They seem to be forgiving about water and food and disruptions, but they complain by laying fewer eggs that day or the next. I get the message: chicken passive aggression. Animals are worth having. Their gentle eyes, voices, purrs, tail wags and soft fur and feathers make it all worth it. Add to that the eggs, the exercise and the laughter, and I’d say the relationships are worth the chores. I consider them a gift, almost a luxury, and I am thankful to be able to host them at my house. It is March and time for change. The time has changed, the weather has changed, and the habits of chickens have changed. They are moving out of their confined existence in the coop and into the fenced pasture. The eggs are now from Pasture Chickens, PC eggs. The hens are laying more eggs, too, with the longer days: 6-7 a day. A weird tiny egg showed up in the nesting box this week. Some call it a rooster egg, others a fairy egg. I cracked it to see if it was fully formed, and yes it is, so I’ll add it to the next batch of scrambled eggs. I was relieved that this only happened once so far. Cute, though. The hens are out each morning before dawn. A hawk swooped over the fenced area the other morning as I looked out, but soon headed into the woods. So far, the count is still eight hens! January is the quiet month after the Christmas season. Epiphany is over, the tree is down and the house re-arranged. A time of new beginnings, a fresh start. The days are still short, but daily growing by two minutes. When I get up in the night, the stars shine brightly and Orion hangs upside-down. My morning routine is still shrouded in darkness until the rising sun lights the hillside a little after 7, and the tree trunks glow. 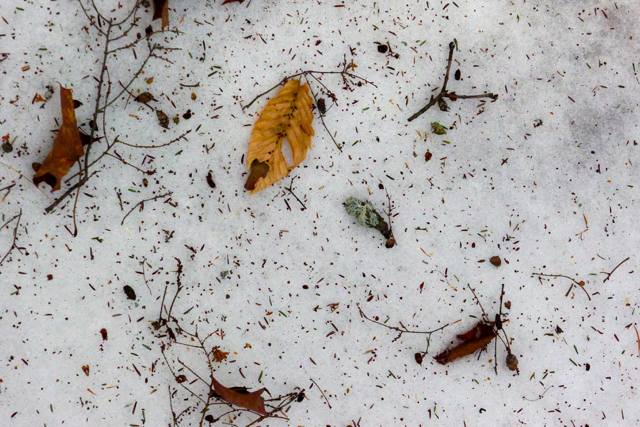 It has been a mild winter with little snow. This week’s snow cover is icy due to an earlier top coat of rain, followed by single digit temps. My treks through the woods are tricky, but with the special spikes added to my boots, I made it along Joe’s Maple Trail. 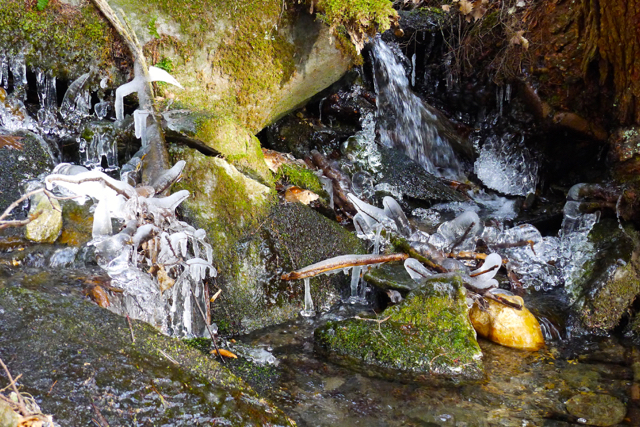 Twice I sat down and slid down a slope, braking with my feet just before plunging into the icy stream. It was worth the risk just to be outside in the sunny, crisp air. Animal tracks along the path looked like fox or maybe even coyote. The hemlocks had dropped some needles and bits which I call “tree crumbs” and they provided some gritty traction. Ian is in Peru for ten days, exploring Huancayo with Fr. Quispe. Up over the pass at 14,000′, I hope he can breathe! Meanwhile, I am literally keeping the home fires burning, eating healthy food, and hosting our son Joe, his wife Virginia and some of their friends. I enjoy these days of quiet, the housekeeping and then the bustle of hospitality. I think I am part bird; I love nesting. 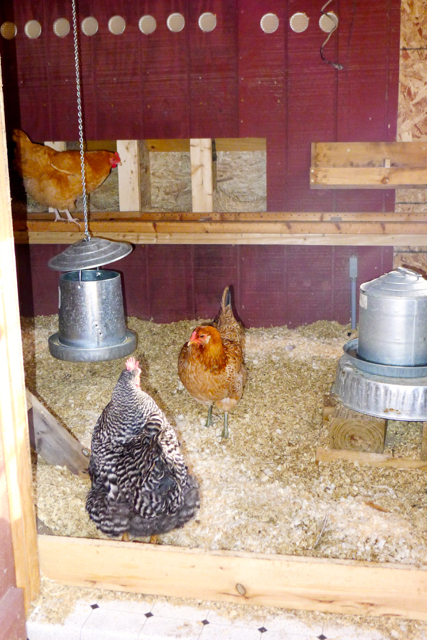 Speaking of birds, the chickens are shut up in their coop for warmth and safety during the winter months. I feel sorry for them since they can’t go out into their fenced yard and forage and walk about. Today I let them out for “recess” and watched over the playground while they picked at the frozen earth and ate bits of grass poking through the snow and ice. Cleo the cat walked by and checked them out, purring as she rubbed up against my legs, letting me know that she feels privileged in her freedom. I think recess will be a daily ritual while the snow is minimal and the sun shines. It reminds me of playground duty back when I was an elementary teacher. Cold and a bit boring. My daily walks head to the stream, up through the woods and into the upper meadow. The pond is full and the bubbler is keeping the water open. Red-berried Winter Berry borders the pond. I keep my eye out for wildlife sipping at the pond. None yet, but winter has just begun. Stay tuned!